Just a quick update, after returning from the Expo Real 2010 (the international trade fair for commercial property and investment, held annually in Munich, Germany). According to the Expo Real Closing Report, the industry is on the up. In trade fair terms: 4% more participants than last year. A total of 1,645 companies from 35 countries exhibited at EXPO REAL 2010, 65 more companies than in 2009. Typically, the Expo Real immediately follows the event where the city of Munich is best known for: the Oktoberfest. Allthough both events are non-related, it reminds me of an earlies post on German real estate prices, under the title “No party, No hangover“. Unlike their local beerparties on the Wiesn, the Germans are said not to suffer from any headaches from property parties. I doubt whether this is completely true, given the situation in which some German open end funds found themselves. But the bottom line holds true: Germans are more prudent and less risk-taking than their Anglosaxon counterparts, when it comes to real estate investing. Allright. Back to the Expo. We have spoken with quite a few property investors, fund managers, agents etc., both German and international. Have no doubt: the market is indeed on the up, as the expo organisation has mentioned. Not only participants and exhibitors, but even in terms of transactions. As I mentioned last week, the dog days are over and institutional investors are acquiring properties again. German institutions are among the top buyers into the European property markets. Quite a few deals of Germans buying into the Netherlands have been published over the past weeks or so. What are they buying? That part is easy. All German real estate investors are interested in just one type of product: Large-scale offices buildings that are not older than 5-10 years, with a single tenant, on a lease that has at least 10 years remaining (15 years is preferable) with a facade that looks good on brochure pictures. No exceptions, they all want just that. And they pay a full price for it. Depending on location, prices are in the 6.4% – 6.8% treshold. In today’s market, that’s quite a high price. 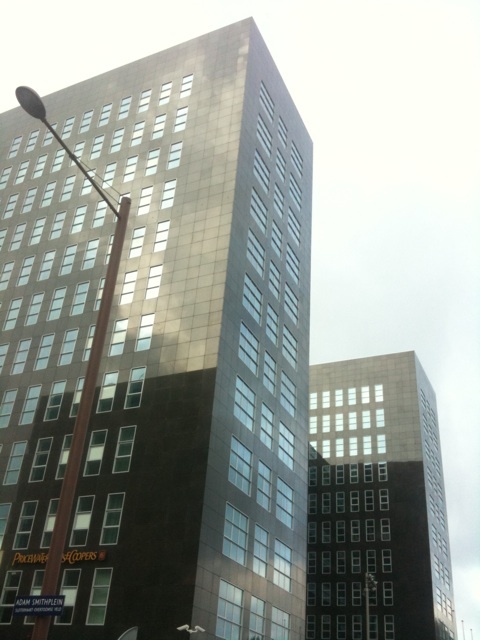 A good reference transaction has been the PWC head office in Amsterdam, that Lips Group sold to NordCapital (picture). When you ask me, such product is boring and leaves little upside from an investment point of view, but such transactions provide yet another impulse to the otherwise liveless investment market. However, it provides a solid cash flow, little handling and, most important …. no headache for the next decade.